It has been a few years since the figure was revealed to a mostly ambivalent public in New York, but hey - she's coming! 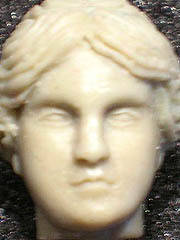 Astrodite is the Woman from Venus, and was the only figure shown to the public which hadn't been produced. It looks like that may change - the official Outer Space Men Instagram showed a couple of shots with the caption "She is coming!" YAY! One of my most anticipated figures of 2016! !